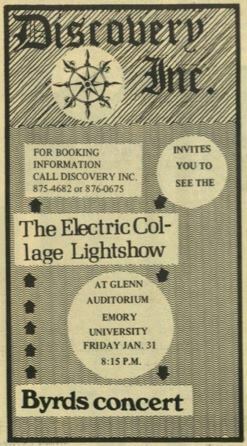 The Electric Collage shows were produced at large venues such as Piedmont Park, Atlanta Municipal Auditorium, Georgian Terrace Ballroom, Chastain Park Amphitheater, Daytona Beach Pier, both Atlanta Pop Festivals, the Texas Pop Festival and many small venues around the south east United States. Many nights were spent 'painting the walls with light' at the old Atlanta Municipal Auditorium. That could be called "Fillmore South" since so many good rock concerts took place there. One show in particular with Steppenwolf stands out in many people's memories. Jimi Hendrix played there. And so did every big name that came through town. They did the light show at the historic Piedmont Park free concert where the Allman Brothers played before they were 'discovered'. They were on a City Parks Department trailer with hastily purchased bed sheets as a screen on the back wall. Then there was the "The Turkey Trip" one Thanksgiving at the Georgian Terrace Hotel when The Allmans were awesome with Dwane at his prime. Every band on the way to success has a moment when the music finally gels and everything works perfect. That was the Allman's that night. 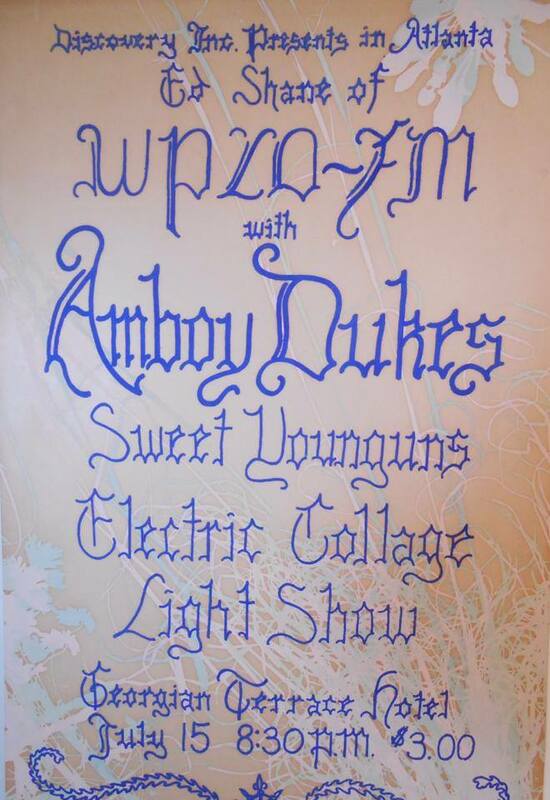 Also it was one of the Electric Collage's best shows. The crowd was totally involved. The synergy in the room was working at top capability. 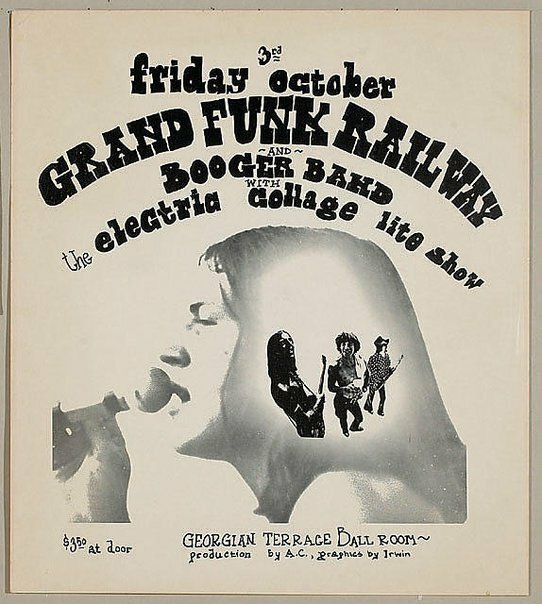 The best concerts were in some large Atlanta venues where the size of the room was just right and the mood was perfect. But the biggest accomplishments for the Electric Collage are the three pop festivals. 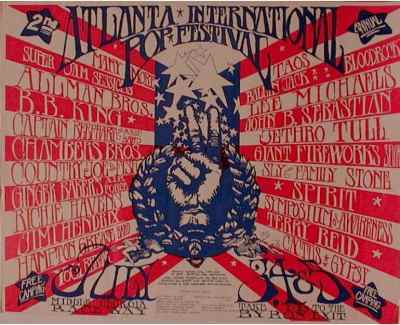 Here are posters of the two Atlanta International Pop Festivals. 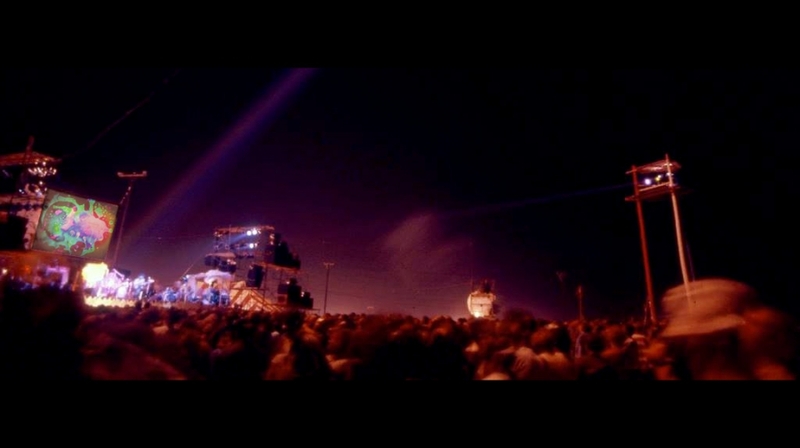 Those and the Texas Pop Festival were the times when the light show had audiences of several hundred thousand. According to attendance records over 750,000 attended the 3 festivals. are for sale at Atlanta Pop Festival Posters. Steve recalls the pop festivals, "At all 3 pop festivals we used a very large rear screen hung between 2 telephone poles. The poles were at the rear corners of the stage and the bottom of the screen was about 6 feet above stage levels so it would not be blocked by equipment and people. The light show tower for the equipment was scaffolding built about four stories high behind the stage. "The pop festivals were a lot of work and unlike a band that played a set and rested, we did every set. We did it without taking drugs, not even caffeine or nicotine, just adrenaline. It was a multi day schedule with planned meals and daytime sleep periods. " 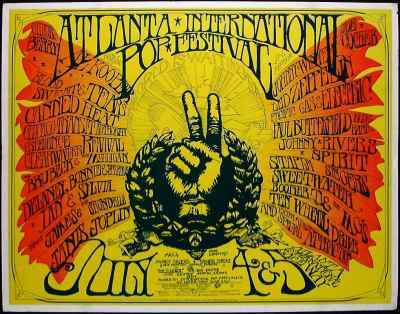 Steve says, "By the second Atlanta Pop Festival we were becoming seasoned old veterans at doing light shows. I had produced the show hundreds of times. Frank and I could read each others's mind and knew how to make the screen come alive with many different visualizations. We never had an intercom during all those years. We just knew what to do next and the spontaneity filled in the rest. That kept the show creative and dynamic. The show was never produced the same way twice". A lot of new ideas were in our heads and we were just kind of chugging along doing them a little at the time when everything changed. After the Second Atlanta Pop Festival the era was suddenly over. There were a few more shows then the equipment was put away and has never been used since. More on that later.